I treated myself to a day off writing – my WIP will reach its conclusion in the next couple of days. Instead I pulled on my (now slightly smelly) running gear and headed off on a sunny morning. To date I’ve been happy enough to do circuits of the neighbouring facilities briefly described in my last post, but this morning I headed to the southern edge of the compact city centre to reacquaint myself with the water meadows. The trails out that way are tailor-made for pedestrians. Bikes not so much though they are well catered for further out. Past Wolvesey Castle (970), the Hospital of St Cross (1132) and Winchester College (1382), this part of the country would be easily recognisable to those medieval folk if they were to pop back today for a visit. 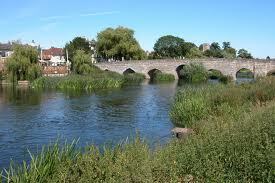 The River Itchen splits into two branches and winds its way gently, reluctantly, towards the sea at Southampton. Leaving the water meadows one joins the cycle network. One curiosity is Five Bridges Road, running straight across the meadows, but which seems to have been extinguished as a highway, leaving it free of traffic. This was possibly at the same time as the controversial M3 works back in the 1990s. Hockley railway viaduct was abandoned as part of the Beeching cuts in 1963. It has particular links to D-Day with huge amounts of hardware and troops using the route to the south coast in the preceding 12 months. Happily it has been recently restored and made available to the cycle network. Finally, a bit of hill training up St Catherine’s Hill, an ancient hill fort, which gives great views of Winchester and the surrounding land. 35 minutes or so driving west from Welford and you hit the Birmingham city boundary. The airport, railway station and National Exhibition Centre take up what swathes of Warwickshire are left after the motorways took the rest. Shakespeare’s County now exists only in those villages that have somehow dodged the destruction. Like Welford they keep up the pretence of timelessness. Five to six miles before the city appear the outer suburbs of Sheldon and Yardley. Former villages themselves, they found themselves swallowed up in the 1930s house building boom. They are, in the main, without character, soul-less, full of people perfectly content to tick off each day as they get older and eventually die. Any excitement comes from Quiz Nite down the pub or treating the family to a KFC or (luxury indeed) a table in one of the many local curry houses. On to the inner city – Hay Mills and Small Heath. An expressway to the south hurries traffic into the city centre but the A45 is the old gateway from the east. The city expanded out this way in the latter part of the 19th century to house the families of the men who kept the factories and foundries going, the Brummie working class. When the Irish started arriving after the War the Brummies looked down their noses at them as they sought basic accommodation. ‘No dogs or Irish’ read the signs. The Windrush generation, beginning in 1948, saw an influx of West Indians to do the menial stuff – bus conductors, hospital porters, labouring. With the crumbling of the British Empire came the Indians, Pakistanis and East Africans. For a while the signs read ‘No blacks, dogs or Irish.’ Then the native Brummies started to up and leave for the outer suburbs leaving the new immigrants to it. I drove slowly up the road. For fully two miles the area has been fully colonised by the new immigrants. From the start they worked harder and longer, especially in retail. They earned their right to stay and theirs is now a thriving and self-supporting community. 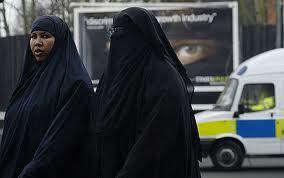 As I crawled along it was a riot of traditional dress and costume, every business now owned by the ‘new’ immigrants. Where Welford is – to all intents and purposes – 100% white, this part of Birmingham is 100% new immigrant. (A misnomer really – many are now second, third even fourth generation). I wouldn’t have been a bit surprised to see a sacred cow wander through the slow-moving traffic. But towards the city end of Small Heath is a white enclave – Birmingham City Football Club. 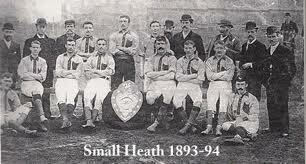 Since 1875 the club has been resident in Small Heath. Everyone is welcome to attend matches but few of colour do. They’re not interested. Instead the white Brummies, like homing pigeons, perpetually find their way back there on match day. 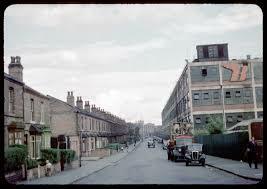 I lived in Small Heath from 1953 – 1956. My Irish parents then moved out to Sheldon. There Mum still lives. And when I retire? Yes I’d stay in Jersey if I can. Welford needs money I don’t have. Sheldon, no chance – I’d die of boredom. Small Heath? You betcha! Full of life and interest, near enough to Digbeth in the post-industrial city and a string of great, traditional bars. And the Brummies, wherever they originated, are as welcoming as any. So which is the ‘real’ England? And where would you live given a free choice? Welford is a quiet village on the border of Northamptonshire and Leicestershire in the English East Midlands. In many ways it still speaks to the rural idyll of maids cycling to church, cricket on the green, mists on the meadow, warm beer. Certainly a couple of weeks here away from the daily grind has been good for the soul, if not the body. This morning the sun shone and the breeze was light as I jogged along the Welford arm of the Grand Union Canal – this extension to Welford was re-opened in 1969. The canals of course have long since outlived their original industrial past. Instead they now teem with barges inhabited by quiet folk content to pass their days doing very little. I could easily fit into that world. The rolling fields are quiet, the harvest is in though this summer the farmers could have waited a few weeks more. The landscape is lush green where the pastures lie, and shades of brown, yellow and gold where the fields have been ploughed ahead of the next planting. Everywhere there are rights of way, bridle paths, permitted access and the folk that live around here respect the land in return. To the east is the village of Naseby. Here in 1645 was the decisive battle of the Civil War when Cromwell’s Model Army defeated the Royalists. You can read the interpretation boards and gaze over much the same landscape as Sir Thomas Fairfax and Prince Rupert of the Rhine did 370 years ago. The village itself has two pubs, one at either end of the High Street. 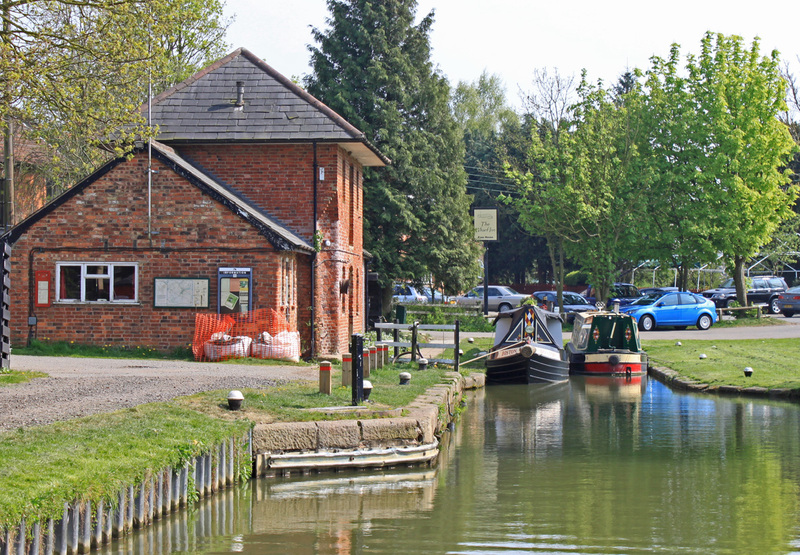 Down by the canal The Wharf is well-appointed and popular with villagers and visitors alike. Decent pub food and a nice selection of Real Ale. The Wharf is a cut above The Elizabethan at the top of the hill and I guess many of its patrons wouldn’t darken its doorstep. 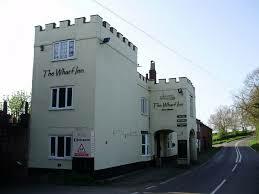 But The Elizabethan is a proper country bar with a pool table, dartboard and – again crucially – well-kept Real Ale. The locals follow rugby more than soccer, with top teams Northampton and Leicester being equidistant. And here they know their music and the jukebox can be loud with guitar heroes. In both establishments dogs are welcomed and you like them or lump them. Tucked away at the side is a Chinese takeaway which does a steady trade. Altogether a great spot. Belying its outward appearance Welford is a hive of activity. There is inevitably an action group, August’s hot topic being speeding through the village. There are clubs and associations for everything – the church choir is in trouble through lack of numbers but the cricket team have started up again. The Gardening Club has a full programme of events and there is a Harvest Lunch at the Community Centre. Crime reported recently – a man bitten by a dog, and petrol being siphoned from vehicles on the nearby A14. But, if one excludes the Chinese takeaway, I don’t think I saw a non-white person in the whole of my time here. So, is this the real England or have I just been living in a sort of ‘Vicar of Dibley’ set for a while? More to come on this.